They said that stress is anticipation of a problem. You know, there is an issue and you are already worried that it will just be uncontrollable and you fear the worst to happen. So to put it simply, stress is 10% problem and 90% anticipation of the issue. I am not a worrier but I am quite perfectionist with myself. So my stress is my own doing. But good thing that I am self-aware. I know when I’m stressed and already figured out that writing helps. During the last Lifestyle sale, I was able to grab this notebook and I fell on love with the message. I have a love affair with notebooks and own several of them. I have one for work notes, one for life goals, I have another for budgeting and this notebook is like a journal to me. It’s not like a diary where you write your day to day happenings in life. This is more like jotting down my thoughts, psyche myself to think positively and release all my worries. It’s more of me talking to myself and advising her to think better thoughts than the current state that I am in. My husband laughed when I told him that writing my thoughts in a piece of paper is better than going to a therapist. He thought I’m going cray cray. But honestly, I usually feel better after writing to myself. Thinking positive thoughts, writing it down, and reading it to myself lift most of my worries and give me peace at night. I know that I’m good in advising and coaching so why not use my talent to myself, right? Haha. I know! I’m really going crazy. This quote basically sums up what I want myself to live by. When I wrote these lines, I am in the state of feeling doubtful of my choices in life and impatient for the things that I want to actually happen. I wrote these on my 35th birthday. These are actually my state of mind and heart that day. It will be amusing to read this back after a few years. I wrote and drew this after receiving some positive news. * He will not give you things that you cannot handle. * You need help? Ask for help. You don’t know the answer? Ask the correct question. * Lift all your worries to the Lord. Raise it to Him. Release your worries, sadness, doubt and stress. *If you believe it’s possible, then it will be possible. * I’m not sure why I even thinking so much of the future. *Be concrete on what you want. Be specific. Be precise. The Universe will give it to you. *My children are my love. My husband is the best thing that ever happened to me. They are my source of inspiration. Try jotting down your thought, your wishes and your heart’s desires. You can use the classic pen and paper but you can use your phone or tablet if you’re the techy kind. See if writing your thoughts makes you feel better. You never know. 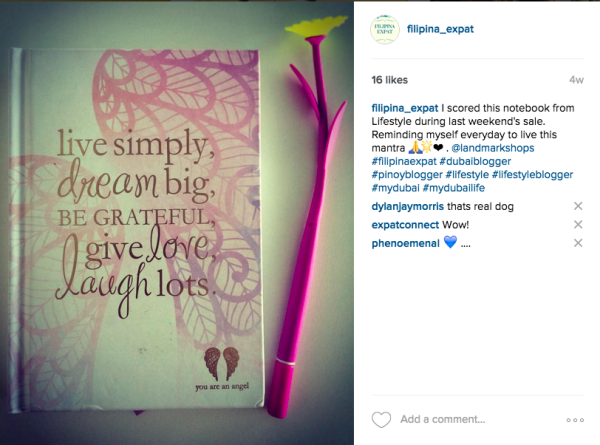 This entry was posted in Musings, Positivity and tagged Dubai blogger, filipina expat, filipino expat, Pinoy Blogger, Pinoy in Dubai.